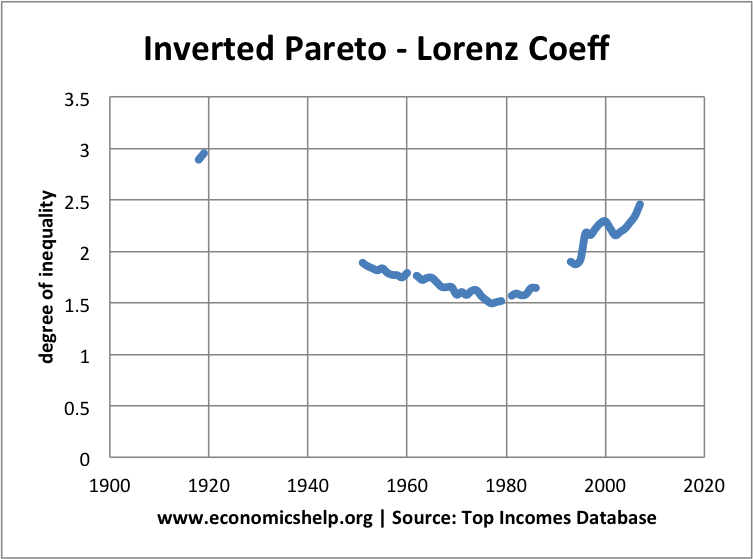 The inverted Pareto – Lorenz coefficient is a measure of inequality. 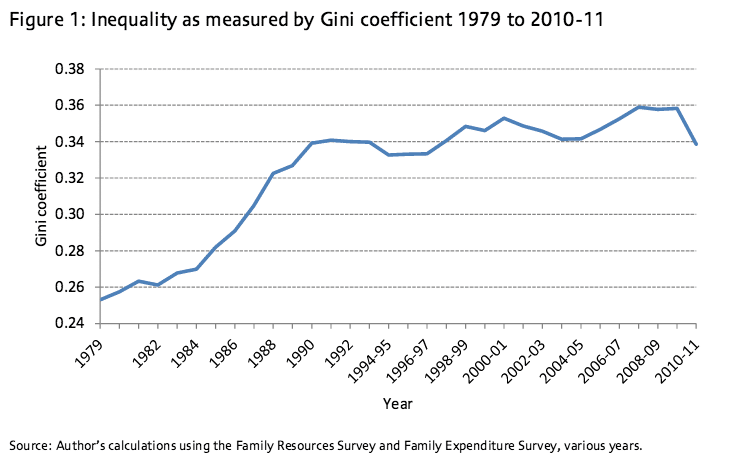 This measure of inequality fell sharply after the war before increasing from 180. Rising wages for the working class. 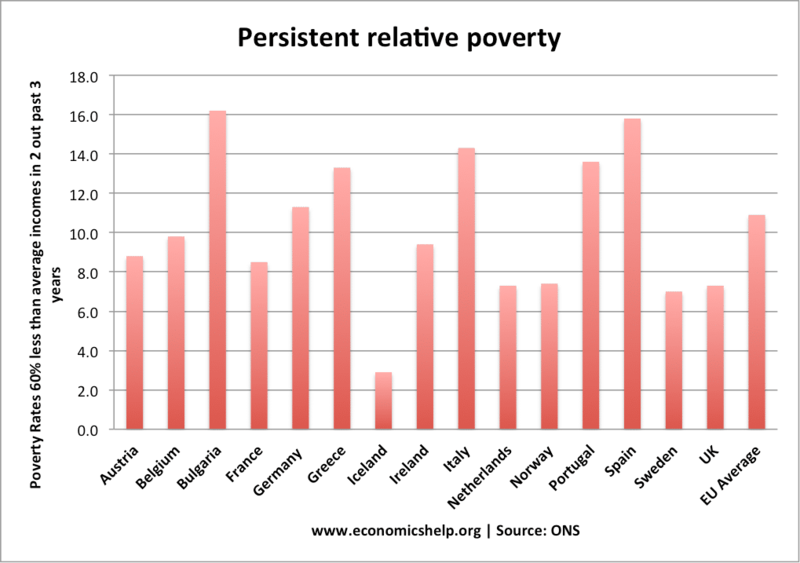 Since 1997, according to an IFS report, the level of relative poverty has fallen during Labour’s term in office. 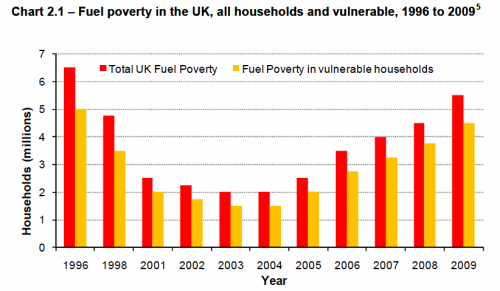 However, in 2006-07, there was the first increase in relative poverty since 1997. 1. An increase in the number of people on benefits. Despite falling unemployment, the number of people receiving state benefits is still around 5 million. There has been an increasing number of people on state benefits such as sickness and incapacity benefits. Arguably there is disguised unemployment. This means that many people have lower incomes. 2. Rising property values have reduced disposable incomes for many young people. Rising property values have made renting more expensive. Therefore, an increasing % of incomes has been spent on housing costs. 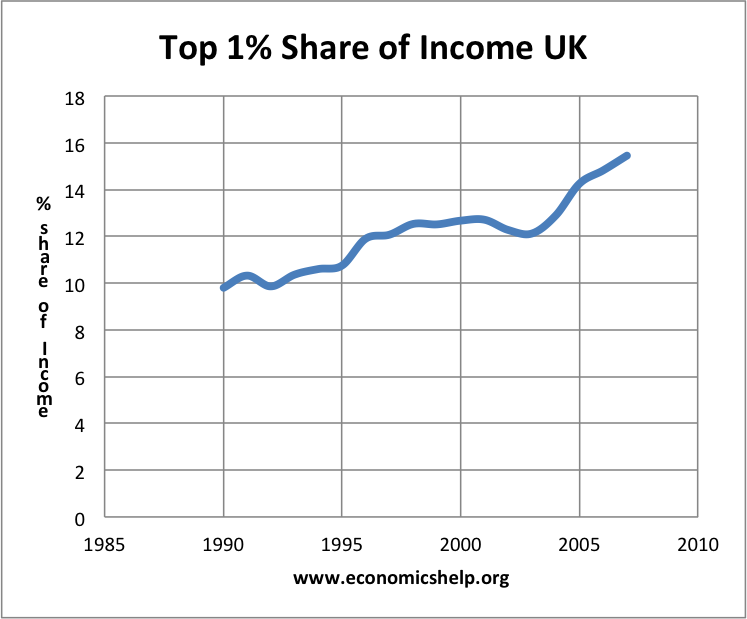 There has also been an undeniable increase in wealth inequality, which often leads to income inequality. 3. There has been an increase in part-time /temporary work. This work is not protected by trades unions and tends to be low paid. 4. 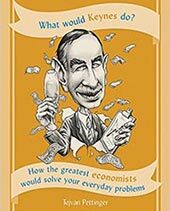 The minimum wage is limited in its ability to reduce inequality. Many of those who benefit from the NMW are second income earners or students who are not particularly poor. 5. Increase in regressive indirect taxes. Taxes on alcohol, petrol and cigarettes have increased faster than inflation. Therefore, they have been taking a higher % of people’s disposable income. This has particularly affected groups such as the single unemployed. 6. Inflation for pensioners has been higher than the CPI rate. This is because pensioners spend a higher % of income on goods like council tax, fuel and food; these goods have been increasing faster than inflation, leaving pensioners relatively poorer. Fuel poverty occurs when households have to spend more than 10% of their income on maintaining the home at a reasonable temperature. 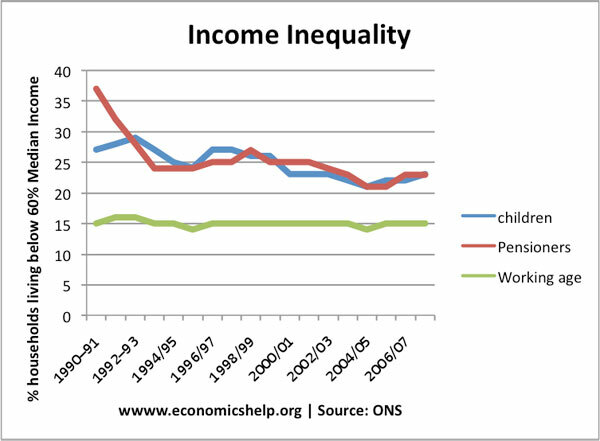 An OECD report suggested, according to the Gini coefficient, inequality had grown in the UK quicker than anywhere else. 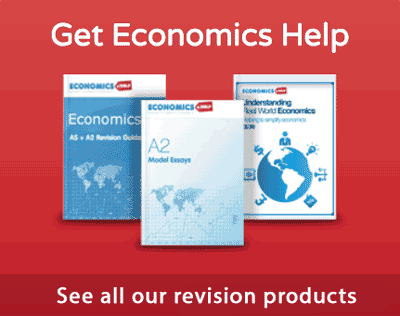 In Britain, the gap in earnings between the richest and poorest in the working-age population has risen from eight to one in 1985 to 12 to one in 2008. Workers in the top tenth now earn an average £55,000 a year, compared with £4,700 for the poorest 10 percent. 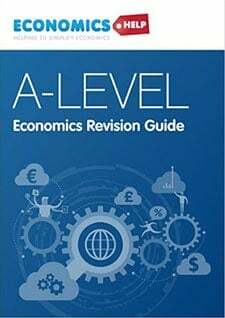 Using a measurement which works out how well income is distributed throughout society, known as the Gini coefficient, inequality has risen faster in Britain than in any other country since 1975. 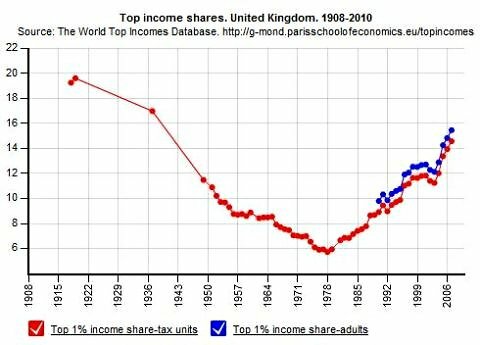 The reason for this increase is mainly down to the fact that the share of total income taken by the richest 1 percent has doubled, from 7.1 percent in 1970 to 14.3 percent in 2005. Within this group, the super-rich 0.1 percent of top earns took some 5 percent of total pre-tax income. 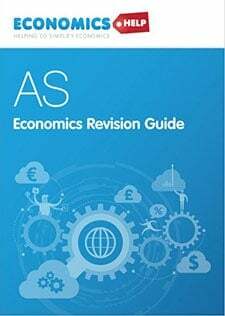 However, the OECD also pointed out that UK government spending on health and education had the impact of helping to reduce effective inequality. 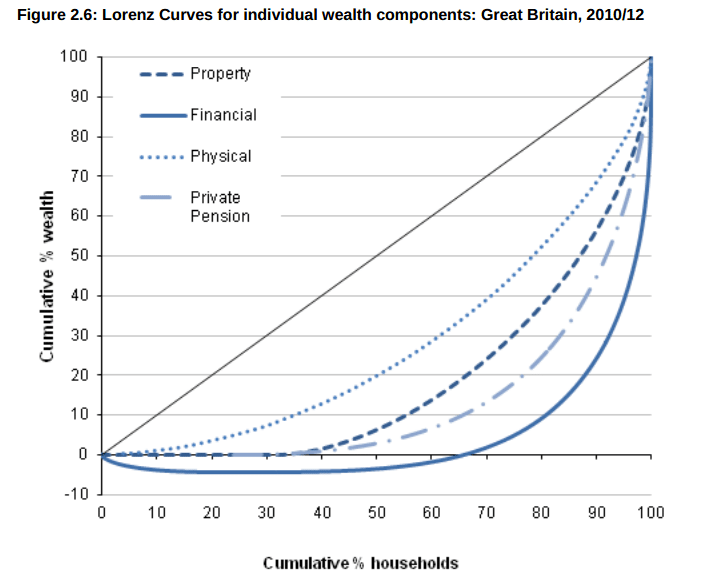 The Lorenz curve shows the cumulative wealth of each wealth decile. It shows that the lowest 38% of individuals have zero property wealth. The top 10% own nearly 50% of property wealth. With financial wealth, the inequality is even greater. WIth 60% of the population in debt and negative wealth. 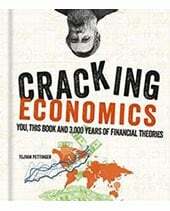 The top 10% have 80% of the nations financial wealth. UK compared to EU average. Since 1990, there has been a reduction in pensioner poverty – the state pension has risen faster than inflation and housing costs have risen faster for the young. 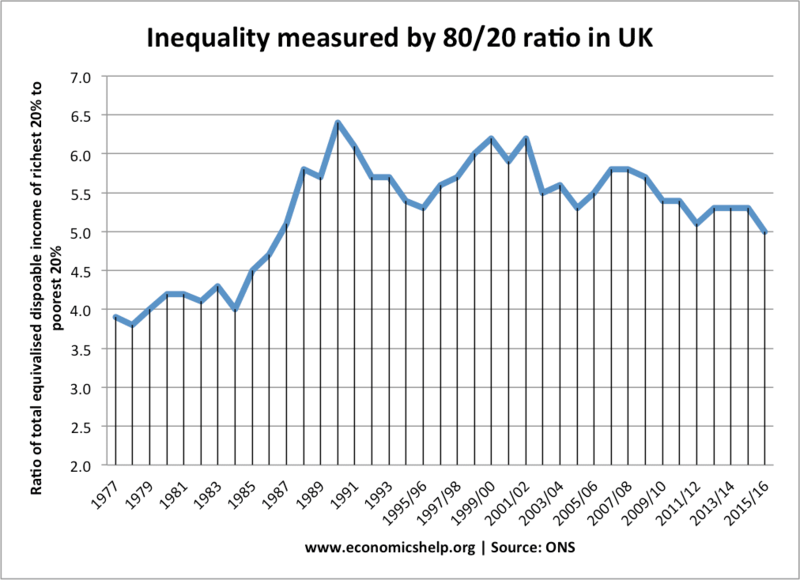 This shows inequality measured by the ratio of top 20% richest people to bottom 20%. Since 1991, there has been a minor reduction in this level of poverty.